The famed Ivy Collection of cafes, grills and brasseries has outdone itself yet again with a brand new location in Richmond. Located at 9-11 Hill Street, The Ivy Cafe Richmond fits in beautifully with its surroundings while standing out at the same time and it's a welcome addition to Southwest London. 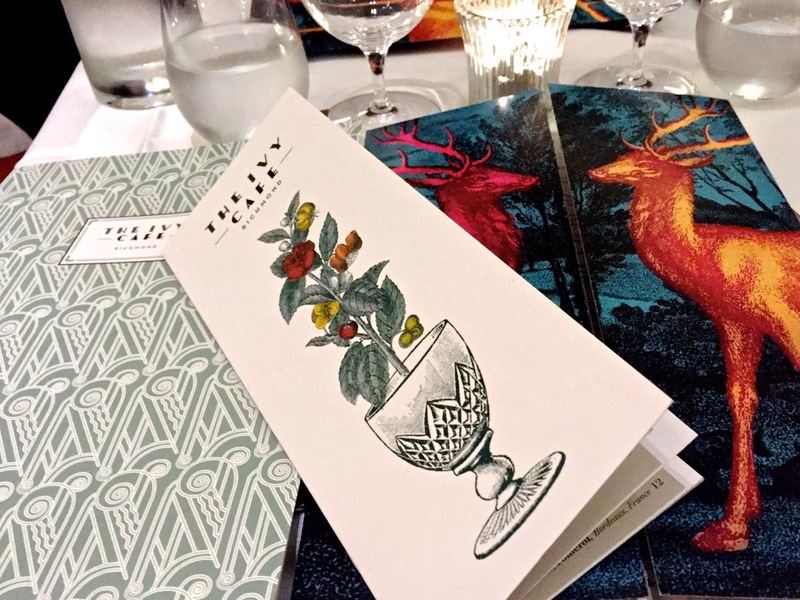 I am quite picky about restaurants and if I'm honest, I'm not always impressed by the bells & whistles that keep other Londoners and tourists alike spending the big bucks for trendy, overrated dinners, but the Ivy Cafe in Richmond has impressed me beyond expectation... I might even go so far as to say that it's now my favourite restaurant in London. Yes, it's that good. Forget about the reputation for The Ivy eateries scattered around our fair city - they are well-known throughout the world as places to see and be seen in London with each having a rather substantial following on social media and a clientele that includes everyone from the super wealthy to it-girls & celebrities. Just look through the windows of any Ivy location in London and you'll see chic, well-heeled diners relaxing with gorgeous cocktails and tempting plates of delicious modern British fare. 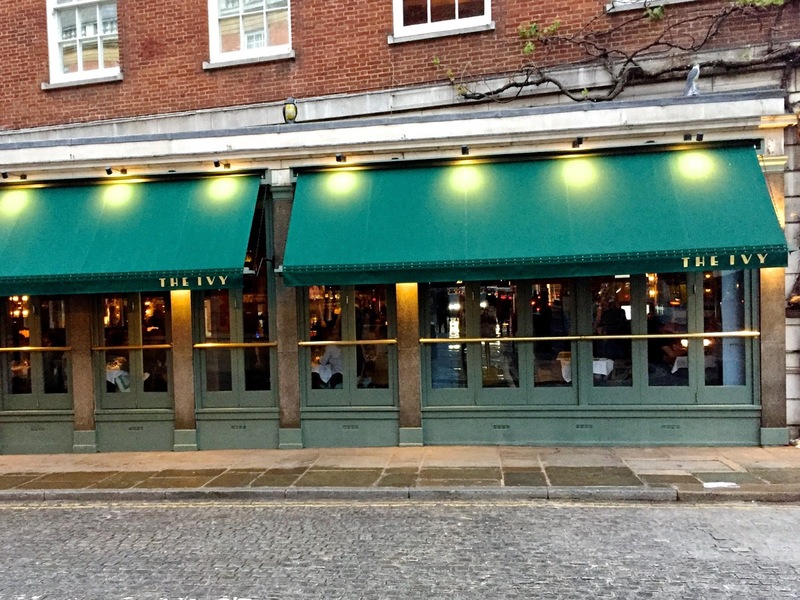 When you say you're going to The Ivy, there's always a certain amount of attention gained... Everyone knows it and wants to go there, but for the purposes of this review, I'm going to ignore all of that - you don't need me to tell you that it's popular. I've personally been burned by overhyped reputations of restaurants time and time again. In this instance, I'm looking at quality, environment, service, value for money and enjoyment. The Ivy Cafe Richmond does not disappoint - in fact, it's amazing! Beautifully presented in a large, old building on a beautiful street, The Ivy Cafe in Richmond offers a classic, chic and understated exterior, but a stunning interior awaits with no detail left unattended. Hostesses in beautiful red dresses greet guests at the door and inside, a visual treat awaits from the intricate floor tiles right on up to the golden chandeliers. Colourful artworks are framed and hanging everywhere with many of them depicting a sort of British country vibe that's so appropriate to Richmond. Brightly hued deer sketches adorn the menus, an homage to Richmond Park I'm assuming and live plants drape off the mirrored bar. Plush leather in bright colours, deco mirrors and brushed brass add depth to the whimsical yet homey decor. Elegant and timeless, it's hard to know where to look and if the table chat hits a lull, there's no shortage of conversation pieces catching your eye at any given moment, regardless of where you're seated. 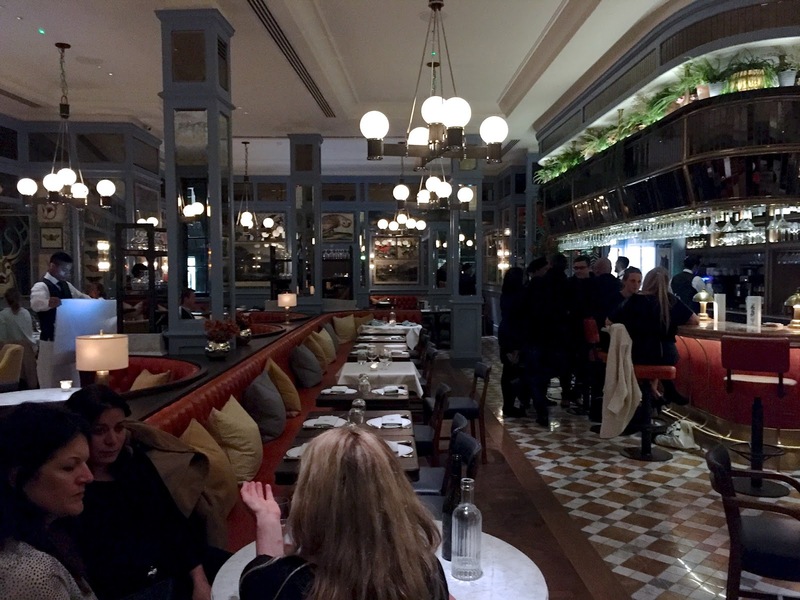 My guest and I were seated at one of the many banquette tables and unlike several restaurants I've visited in recent months, we had more than enough space, something that's such a luxury in a London restaurant these days. The cocktail menu is a great place to start your evening and there are two concoctions specifically created for the Richmond location, so of course we had to try them. The Star and Garter Spritz is as delicious and refreshing as it sounds - a grapefruit take on a traditional spritz cocktail and pretty much everything you'd ever want from a summer tipple featuring Kamm & Sons aperitif, Pierre Ferrand Dry Curacao, fresh pink grapefruit, Prosecco and soda. For those who like something with a little more of a kick to it, the Hill Street Hanky Panky is a nice alternative to a Negroni made with Beefeater Gin, The Ivy Richmond Cafe sweet vermouth blend, Fernet Branca and topped off with orange oils. Having also attended the preview just before the opening, I can also vouch for the Richmond Park Kir Royale, a deliciously glam & bubbly cocktail with Briottet Rose Liqueur, Sipsmith Sloe Gin and hibiscus topped with Champagne. If you're not sure which cocktail you'd like best, don't be shy... Just tell your server what you normally like and ask for a recommendation. We found the staff recommendations superb and loved everything that was suggested to us. As far as wine goes, we left our choice to the manager who chose a 2015 Chateau Moulin Favre Brouilly Vieilles Vignes and it was perfect. She explained that the wine was her favourite, that it had a metallic quality to it that would pair nicely with the iron in the steak and she was absolutely right. While the luxury and excellent service are on point at The Ivy Cafe Richmond, I must say it all really comes together when the food hits the table. Everything I ate was more incredible than the dish before and I've found myself daydreaming about this meal ever since. I started with the Oak Smoked Salmon served with black pepper, lemon and granary toast. It was incredible, subtle and flavourful while the bread was delightfully fresh. 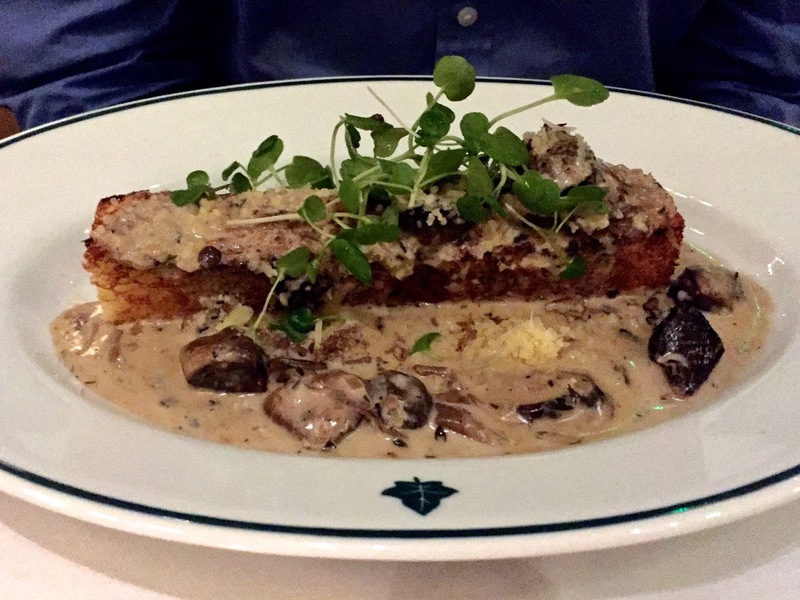 My guest opted for the Wild Mushrooms on Toasted Brioche which featured mixed sautéed mushrooms in a cream sauce with grated truffle and Gran Moravia. Choosing a main course was a tough job... There were so many dishes I wanted to try - they all look so amazing! To people who know me, it's no secret that I'm a pretty picky eater... 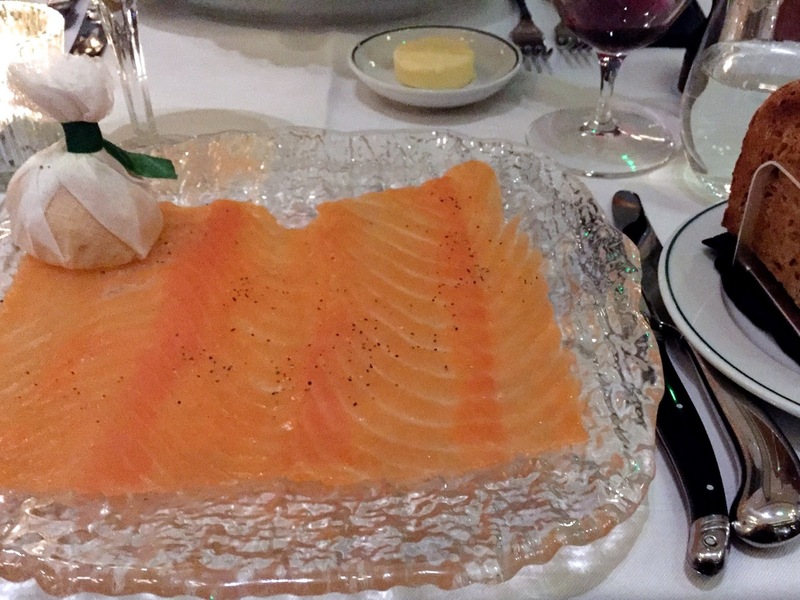 It was refreshing to dine at a restaurant where there were multiple dishes I wanted to try. In the end, I opted for a fillet steak, medium rare with peppercorn sauce and green beans with roasted almonds on the side. 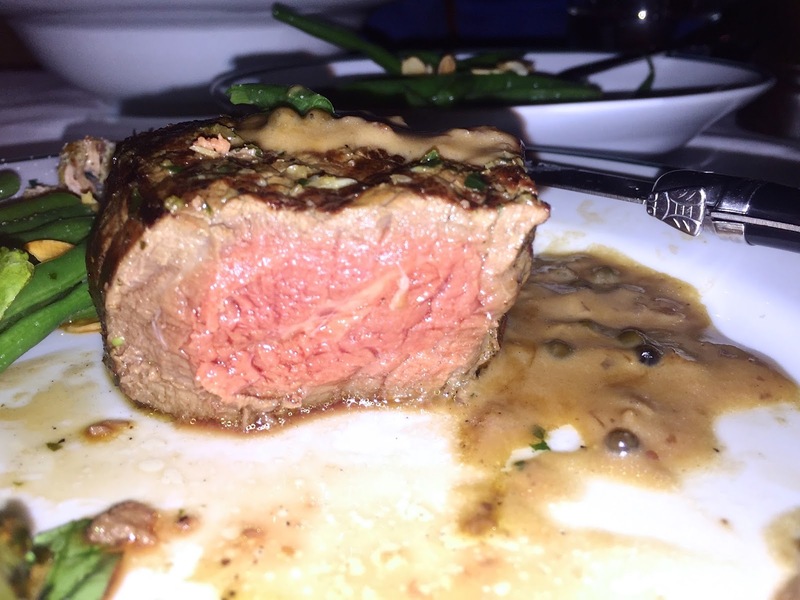 I generally think a steak is a pretty good indicator of the quality of a restaurant... In my experience, if the steak is right, the other dishes usually follow suit. I couldn't have been happier with my choice... Steak is my favourite and the fillet I had at The Ivy Cafe Richmond was the best I've had in London so far, if not the best I've had anywhere. It was beautifully cooked and perfectly pink with a sort of saltiness around the outside and the pure, uninterrupted flavour of the meat on the inside. The beef was so soft it could nearly melt in your mouth and the size was just right. The peppercorn sauce was just creamy enough and so flavourful. 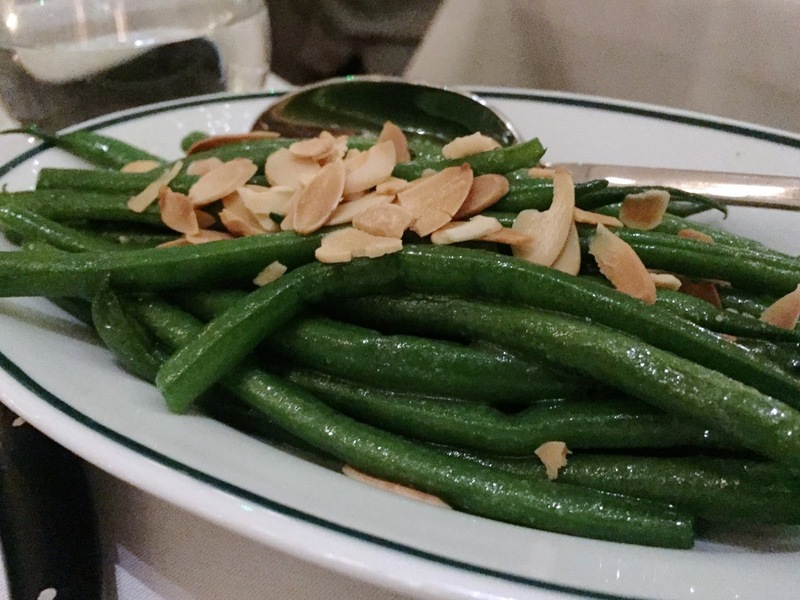 Paired with the green beans topped with fragrant roasted almonds, it was in my opinion, the perfect meal. 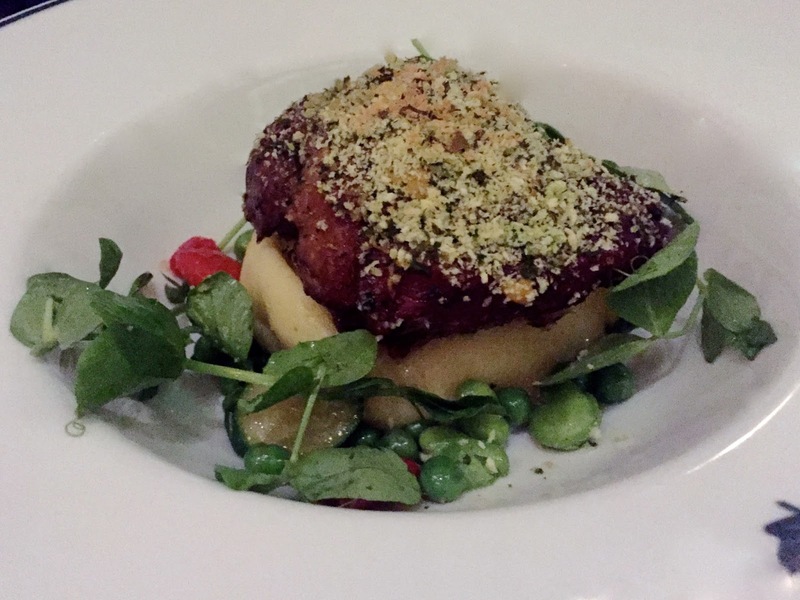 My guest ordered the Slow Roasted Lamb Shoulder which featured a mustard and herb crust. The lamb was served on a bed of creamed potato with garlic, spring vegetables and a rosemary sauce. It was as beautiful to look at as it tasted and the meat was so tender, flavoursome and delicate, like nothing I've ever tasted. Dessert followed of course and again, the choice was tough. For pudding purists, the Crème Brûlée is as smooth and light as you can imagine with the perfect delicate crust of sugar on top. Served in a small copper skillet, it's a refreshingly normal, no-frills version of everyone's favourite classic custard dessert. While some might find that unimpressive, I'm more partial to the if it's not broken, don't try to fix it school of thought... In my opinion, the beauty of a great crème brûlée is in the flawless execution, not in the creative ways to embellish it or in the trying to turn it into something it's not and on this score, the Ivy Cafe Richmond absolutely nailed it. The Flourless Cappucino Cake was so comforting and served up a caffeinated kick you could only expect from a good, hearty double shot of espresso. The warm cake set in a frothy milk mousse and drizzling with a sauce was as beautiful a presentation as it was a sensible one... It was indeed like eating a cappuccino with a fork. It's quite a rich dessert so not for the faint of heart, but this coffee addict loved it! If drama is what you love, I would encourage you to consider the Chocolate Bombe. We didn't order this dessert, but everyone around us did and we enjoyed the magical presentation every single time, which was appropriately accompanied by oohs and ahs... Presented as a beautiful chocolate sphere in a bowl, the dessert is set in front of you and then a warm sauce is poured over it, melting the chocolate shell to reveal the final presentation. I didn't have to try it to be impressed or to know it was delicious... There was a lot of lip smacking and satisfaction on either side of me from those who ordered it. Value for money is absolutely on point at The Ivy Cafe Richmond. I couldn't believe how reasonably priced the food & drinks are in comparison to other London restaurants. The quality of everything from the cocktails to the desserts or even the Pinot Noir by the glass we enjoyed at the end of our meal, was superb and yet not as expensive as some of the top restaurants in London. We are all insanely busy and dining out in London is expensive for most people these days, so it's important that a dinner out not feel like a waste of time and/or money. 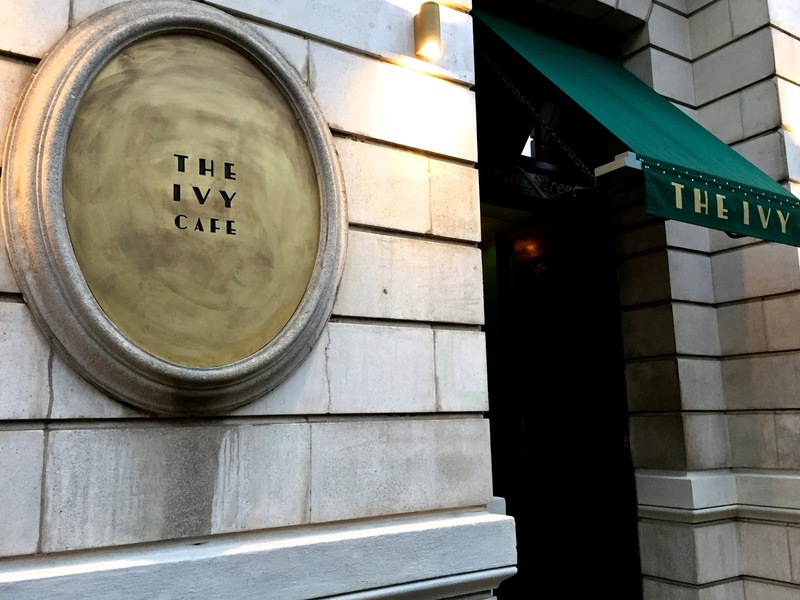 I can assure you that if you're a fan of modern British food, a night at the Ivy Cafe Richmond delivers beyond expectation, but it's also open for breakfast, lunch and weekend brunch. I'm personally very excited to head back down Richmond way to try The Ivy Café Shepherd's Pie with slow braised lamb shoulder, beef and Wookey Hole Cheddar potato mash - it sounds like the perfect comfort food to enjoy after a long walk through Richmond Park spotting deer! The Ivy Café Richmond opened in April 2017 and offers all-day dining seven days a week with a menu featuring modern British and international classics. 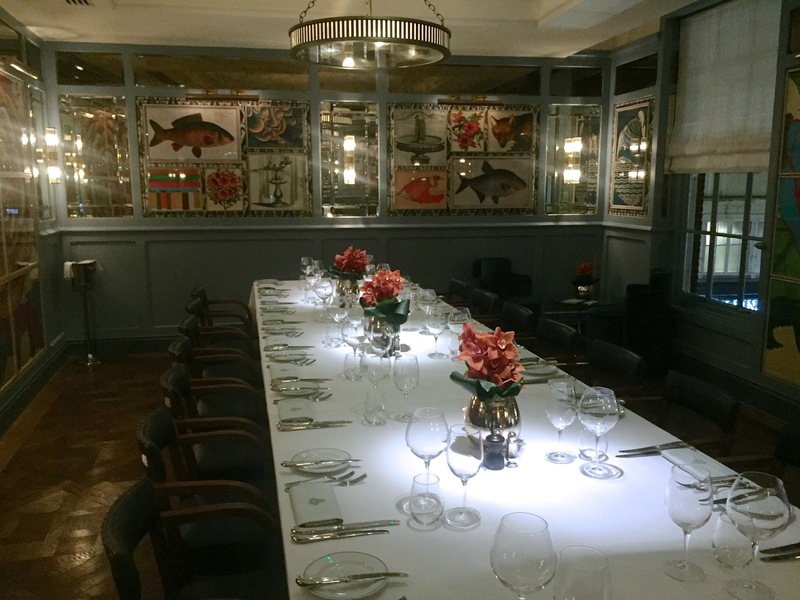 Featuring a private dining room and a bar, the restaurant is situated near the River Thames and just minutes from Richmond Park and only a short walk from several buses, the Richmond Underground and Train Stations. For more information or to book a reservation, visit theivycaferichmond.com.